The Roth course is ideal for fast times, and this year the weather was good as well – fresh in the morning with the sun quickly coming out, temperatures around 28°C by the time the Pros started their run and absolutely no rain. While a number of athletes had great races (including of course the winners Jan Frodeno and Daniela Ryf with their fantastic times) the overall times were much in line with what I have analyzed for Roth before: The overall adjustment of 19:46 leads to a new course rating of 18:54, and the individual adjustments for the swim, bike and run legs were “Roth normal” as well – and very much in line with 2011, the year that Chrissie Wellington and Andreas Raelert set the world records. Jan’s swim time of 45:22 beat the old Pro course record of Pete Jacobs from 2009. Jan’s 4:08:07 is the fastest bike time of 2016, also beating the course record set by Andrew Starykowicz last year by a minute. Jan’s 2:39 run was the fastest run of 2016, but only for 20 minutes until Joe Skipper posted a 2:38:52 – fastest run of 2016 and also a new course record. Joe Skipper’s 7:56:23 is a new British Ironman record and also the first sub-8 by a British athlete. 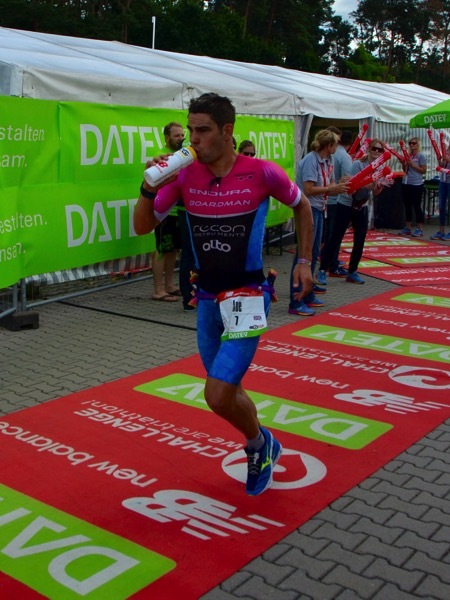 Cyril Vienot’s 8:02:44 is a new French Ironman record. I’ve had a great time following the race in Roth, enjoying the race and it’s fantastic atmosphere. 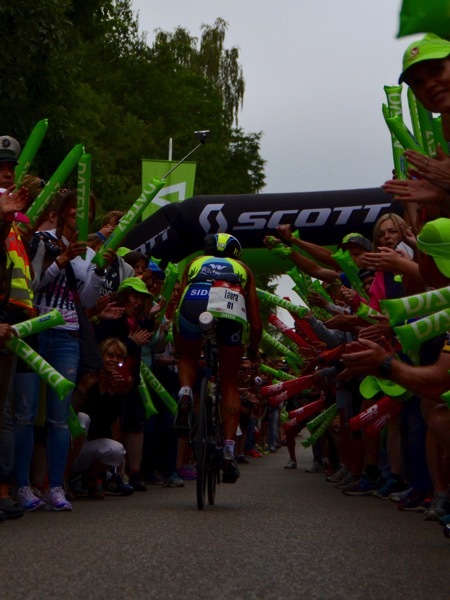 Anyone who has not ridden the Solarer Berg before, have a look at fourth place finisher Laura Siddall riding through the crowd, and put this race on your bucket list! It was clear from the start that Jan Frodeno wanted to really go for the world record as he had announced before the race. He quickly swam away from the field and by the end of the swim he was already more than 90 seconds ahead. He continued to put time into the others, and even even a small crash when he overcooked a corner on a downhill couldn’t slow him down. 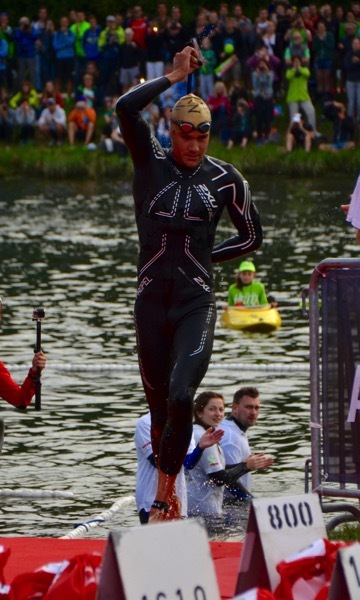 By the time he reached T2 he had added almost another ten minutes to his lead and was well ahead of world record pace. He continued to push on the run (posting a 2:39, another personal best) and broke the world record by almost six minutes. A fantastic performance by Jan, and one that shows that he’ll be the clear favorite to defend his title in Kona. Second place went to Joe Skipper who finally managed to put together a good bike ride and a great run. He was riding in the third bike group with Cyril Viennot and some others, and while a 4:21 is not slow he still lost some time to the second group with Nils Frommhold, Tyler Butterfield and Nick Kastelein. On the run Joe was reeling in one athlete after another and even managed to overtake Nils in the last few kilometers to claim second place in a well executed race. Third place went to defending Champion Nils Frommhold. A sub-8 is nothing to be ashamed of, but Nils seemed disappointed that Jan proved he is a step or two above everyone else. Compared to the great races that Frodo and Joe had, Nils’s day pales a little bit. He quickly lost contact to Jan on the swim, then rode with Tyler and Nick but the gap to Jan increased with every split. Nils then had a good 2:48 run but couldn’t make any inroads into Frodo’s lead. Then Joe Skipper took second place from him just a few k’s from the finish. I still think that Nils should be proud of his race, especially after his 29th place in Kona and his DNF in Texas he had a solid race even when things didn’t go quite the way he was hoping for. It’s now time for him to plan his second half of the 2016 season – and he is looking forward to hist first child in November. 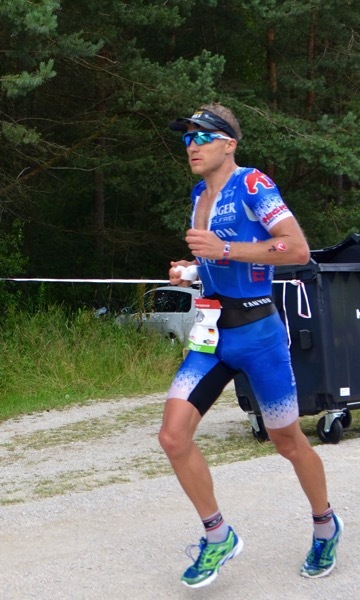 With extra “daddy power” you can expect him to be back in Kona 2017! Daniela was as dominating in the women’s race as Jan was in the men’s race – both won by more than 20 minutes ahead of second place. After the frustrating DNF in Frankfurt only two weeks prior to Roth, Dani had a race and result she could enjoy immensely. The fastest time in all three legs and her first marathon under 3 hours lead to a fantastic 8:22, missing Chrissie’s record by only 4 minutes. After the bike she was even under world record pace, something probably no one expected before the race. Dani can be more optimistic about the rest of the season – any doubts after Frankfurt have been blown away with this result. 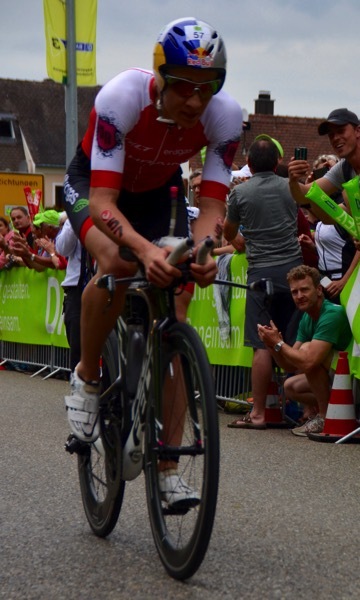 She still has to validate her Kona slot (likely in Zürich next weekend), but after that she’ll focus on defending her 70.3 and Ironman World Champion titles. As last year second place went to Carrie Lester. In the pre-race coverage she was hardly mentioned, the focus was initially on a “Yvonne vs. Anja” duel, then shifted to “Daniela vs. Yvonne”. Carrie didn’t seem to be too concerned and was just focused on a good race. 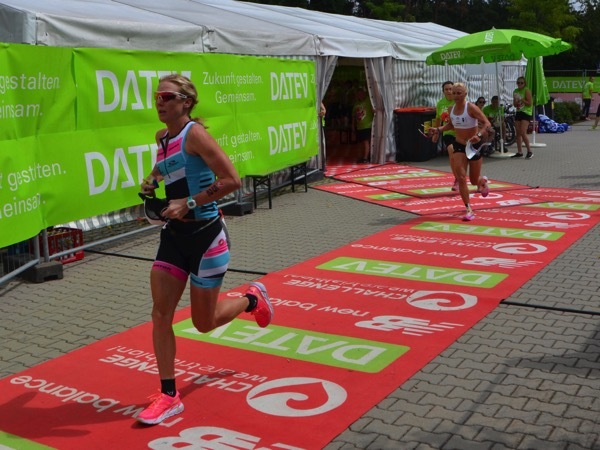 She had a good swim, reaching T1 with Michelle Vesterby and Anja Beranek. When Michelle had to drop back with mechanical issues and Yvonne had ridden up to Carrie and Anja, the three were riding together for most of the bike course and reached T2 within a minute of each other. Anja quickly fell back in the first half of the run and Yvonne did her best to chase down Daniela, but Carrie didn’t loose too much time.. When Yvonne started to struggle as well, Carrie ran by her and took a very satisfying second place with the best relative performance of the day. Yvonne was vomiting towards the end of the run and had to dig deep to stay in third place, posting her 11th sub-9 time.